"Great side dish with chicken, beef or pork. Easy to prepare." Reduce heat to low. 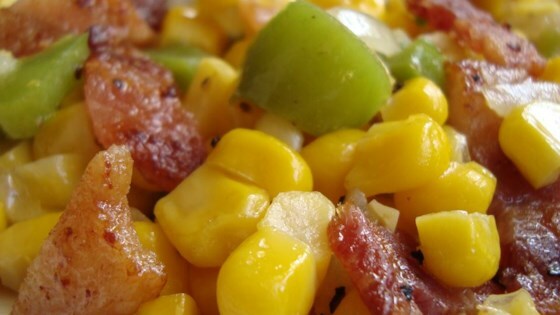 Stir corn into skillet, and cook until tender, about 15 minutes. Salt and pepper to taste. Do not drain grease from bacon - that is the secret to the flavor. I was asked to bring a vegetable for Christmas dinner--Boring! But when I brought this brightly colored, flavorful corn, everyone raved and asked for the recipe--Fun! To prevent this from being so greasy, i cooked the bacon separately and crumbled and tossed together at end. All the ingredients came together nicely. Nice side dish. I couldn't even imagine putting the corn into all of that bacon grease so I drained most of it off and was still left with a nicely bacon flavored side. Thanks Michele!